Nick Sheppard, Leeds Met University (aka MrNick on twitter) has written a good article in the most recent Ariadne about the Welsh Repository Network/JISC workshop back in May looking at the interaction between CRISes* and repository systems. As I was unable to get to this event due to prior commitments, it was good to have a chance to catch up on the discussions. 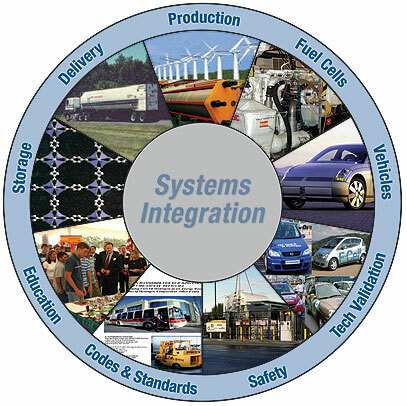 I was interested to note that a CRIS (Current Research Information Systems) can go by many names – given that the UoL Research Office often refer to them as RIMS – Research Information Management Systems. They’re not alone as many universities seem to have renamed them as RMAS or ERA and the like. But at their heart they are systems that not only gather in research publication data (and much more), but actively link to other systems – chief among them from my perspective interlinking with a repository. The question “Is an IR a subset of a CRIS?” posed by one speaker (Simon Kerridge, ARMA) is an interesting one. Having seen a number of recent CRIS vendor demos, it is one that is clearly approached in different ways by different organisations. Some very much see the IR as a satellite system, fed largely (but not entirely) by the CRIS. For others it is more of a subsumed system – with a visible front end peeking out, but the rest of the body absorbed by the greater whole. I must confess so long as the workflows for such issues as rights verification and data management are still handled by the elite repository administration team I don’t have an especial problem either way. However, if a CRIS/Repository union means that a repo is just a reflection of the CRIS data set, locked down without the additional resources embodied and ingested by the IR over and above the REF related items; well then I’m a little more uneasy. The talk from St Andrews’ Data architect Anna Clements (which came with some interesting but not readily comprehensible diagrams) brought up the CERIF standard. Interesting that St Andrews has been pursuing links to their repository for far longer than many other institutions, which has demonstrated the advantages of working closely together with research support personnel (something I’ve benefited from here at Leicester in the past two years and can heartily concur). Meanwhile William Nixon and Valerie McCutchean of Glasgow gave a very useful overview of the integration of the repository with a CRIS. I was able to plot from my own experiences whereabouts we are in this process here at Leicester. They raised a valuable point about author authorities – something that has long concerned me as an issue to which I don’t have a ready solution. In some regards I’m hoping the CRIS implementation here will allow us to tackle and resolve this at that point – given that unique IDing of authors is something that is key for bibliometrics and REF returns alike. I notice William doesn’t appear to have offered a solution though in his talk, which is perhaps a slight concern for me. I wonder how difficult it is going to be to match an author of a non-REF item that routes into the repository from beyond the CRIS with the institutional verfiied author list. And what about external additional authors? I suspect this is going to be a major issue for me and my team to resiolve and one that I’d welcome external insight on. Finally my old friend Jackie Knowles talked about the pitfalls of implementation – most of which I am, thankfully, already well aware. I think we definiely need more of these warts and all case study examples though; as at the end of the day those of us working at the sharp end of repository/CRIS interlinking will need to know how to work around so many of them. It sounds like this was an excellent day (and perhaps in serious need for near future repeating!) and a definite must read artilce for anyone about to establish, or already working towards, a CRIS/Repository interlink. 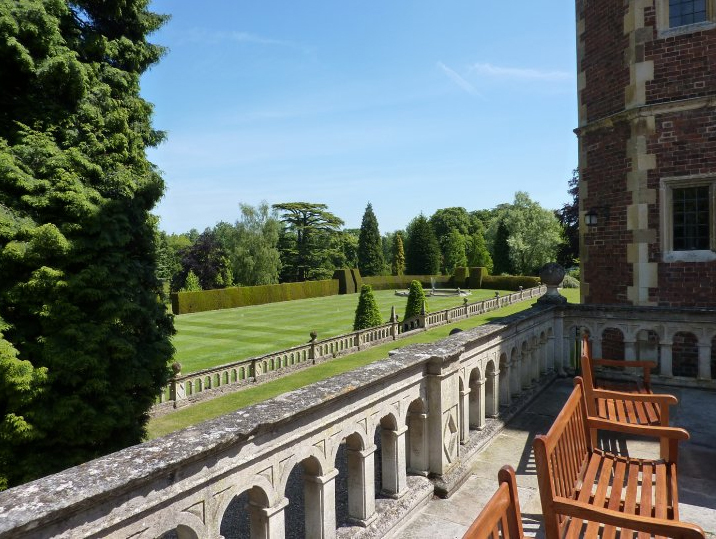 A week or so ago I attended the RSP summer school at Madingley Hall, University of Cambridge. The Summer School has been running for three or four years now (I helped organise the first one) but until now I’d never found the right time to attend. Originally these three day focussed study events were aimed at first time repository managers, but clearly the support remit of the RSP has broadened considerably. It could be seen from the delegate who ran the breadth of experience from old hands like myself or Graham Stone (Huddersfield, and UKCoRR chair) through to people only just taking their first steps. To cover an event in any real depth would take far too many lines of text, so what I’ll attempt to do here is try and capture a flavour of the event, with any especial highlights. As with all events day one began with the gathering of the 20 or so delegates from across the country, some of whom had been travelling since before 5am in order to get there. Following an introduction to event from Dominic Tate and Jackie Wickham of the RSP we moved to an ice-breaker exercise, creating a poster to encapsulate the discrete elements that make up a repository – and then selling them to the group at large. There were some interesting insights that came out here including the challenges of the REF, working with academics as well as the technological barriers to progress. In many respects this was a good opportunity for some reflection on our advocacy work and the differing messages to different stakeholder groups. After tea the first talk was from Tanya Abikorr of MIT Open CourseWare. Her focus was more on educational repositories than institutional, and was possibly of more interest to those working on coursepack digitisation. What was very interesting to note was the size of the MIT team working on this (at least 7 full time staff), and some of the comments about what is permissable under US copyright law. As one of the speakers on day 2 pointed out, UK copyright law is actually far more restrictive than this. Finally Graham Stone talked about the Huddersfield repository experience in some depth. The second day was the most hectic and packed, and despite a cancellation of the first speaker the delegates engaged in a long (possibly overlong) session on IPR, copyright and repositories from Laurence Bebbington (Aberdeen University). There was much of value in what Laurence had to say, although at times it seemed to take him at his word on what is and is not permissable would freeze developments in the repository field. He was followed by Bill Hubbard (CRC, Nottingham University) looking at institutional mandates and compliance. While few delegates had an OA mandate, most institutions represented are considering implementing them in one form or another. There was a considerable amount of talk focussed on the carrots we can offer, contrasted with the more stick like mandates, during this session too. Following a brief update on the RSP’s work from Dominic, David Davies (University of Warwick) presented the results of some research looking at what people look for when searching for online learning resources. I must confess that I found David’s talk hard to follow, and while the discovery and exposure of the contents of our repositories is often paramount in my mind, I found it problematic to join what he was espousing with our every day practice. The day was capped by the delightful Robin Armstrong-Viner (Aberdeen University) who gave a fascinating talk looking at how a repository and CRIS can work together in practice. While a few technical hitches denied Robin the practical demonstration he’d planned at the end, it was still fascinating insight as to how a CRIS can change the workflows and relationships that repository staff have within an institution for the better. The final day was very practically focussed with a reflective session on advocacy from Dominic echoing at least in part some of the previous two days activities and coverage. One thing that was clear from delegate comments is that there is still much work to be done in this regard within most if not all institutions; and that we should not be downhearted by the repetition that is required. We also touched briefly on the some of the work of May’s RSP Advocacy workshop. complementing Dominic’s session nicely was Nicky Cashman (Aberystwyth University) who gave a fine overview of using statistics as a tool. While the mathematical components weren’t new to me, some of the approaches and uses to which Nicky puts them had me scribbling notes for future consideration. The final full session from Ian McCormick (ARMA) was a little disappointing. As an overview of ARMA it was fine, however as to the role at which repository managers, UKCoRR and RSP could play in tandem with the organisation this was much less clear. What was clear from the delegates was increasingly we are all working more closely with our research office type colleagues with whom we share much more commonality on many issues than those in the libraries within which many repositories are based. Overall though it is safe to say that this was an excellent and information packed event. 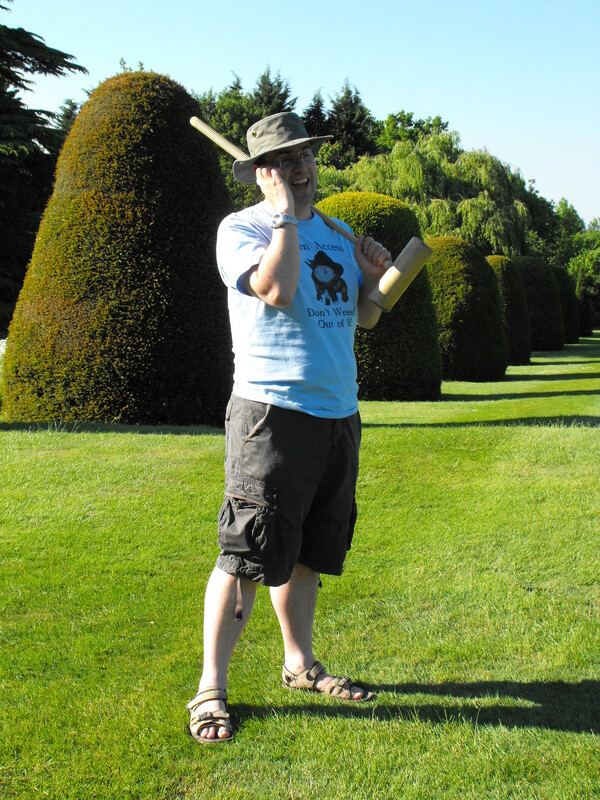 The opportunities for networking (and in my case to also lose at croquet twice) were especially very valuable, and continued throughout the delicious meals and long into the night. I’ve returned to work with a much greater insight into what is going on across the country, as well as numerous practical ideas to apply within our repository work. As is always the case at these kind of events in one way or another we are all facing similar challenges ranging from academic engagement, compliance, deposition, changing copyright environment, staffing challenges and of course the REF. But what is heartening is the number of different ways in which people have found to meet these; and while not all are applicable to Leicester’s environment many are. Slides from the event can be found here. And with apologies for the terrible grammar in that title. 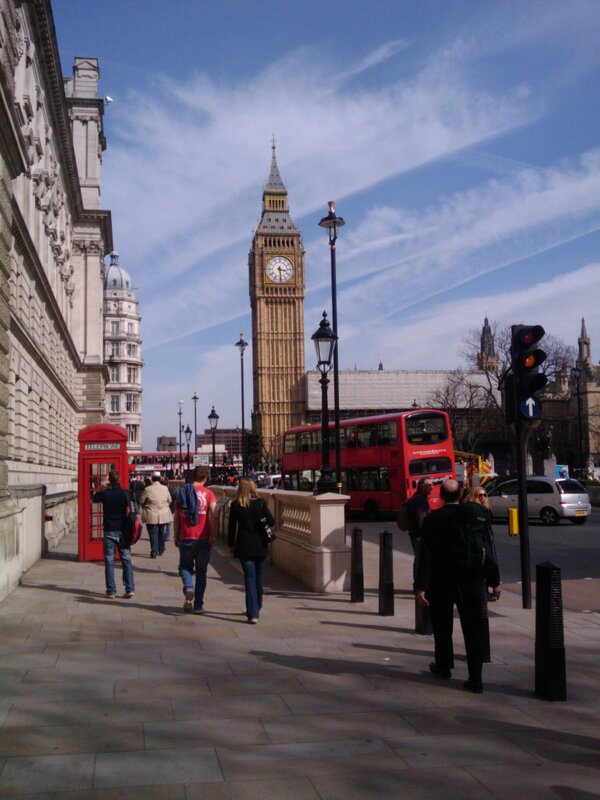 Friday I went for my second jaunt of the month down to London to attend their Communication Skills for Advocacy event. As someone who’s run a few events of this kind myself in a previous life I wasn’t originally planning to attend, until Dominic Tate of the RSP invited me along as a facilitator. I’m glad he did as the day was actually incredibly useful, even to someone like myself who likes to think of himself as an old hand. The event took place in the one of the rather wonderful conference suites at the Kings Fund, Cavendish Square. Along with about 30 other repository managers and workers we were welcomed to the event by CRC’s Bill Hubbard. The bulk of the day was facilitated by Deborah Dalley whom did an excellent job (although I’m not sure I was overly keen on the use of the phrase “Did that resonate with you?” – but that might have been a simple gut reaction). Following on from this we did an audit of our own sources of power, which helped us to understand where we were perhaps coming from ourselves. I think I concluded that personally within my role I end up using Coercive, Expert, Reward, Personal, Information and Connection sources of power; but was weaker on position (aka authority) and Association Power. We also took a look at the perception position that we adopt with respect to influencing, the importance of adopting the 2nd position (that of the other person) to truly understand where they are coming from and why they might not want to agree with us. Before we moved into a coffee break we turned to examine channels of communication – which I was proud to say I managed to have a large number of. Okay, so I’ve plenty of ways to communicate with people, I just need to work on my influencing skills somewhat was the message I emerged from the morning with. After coffee we looked at putting influence into practice to develop a short pitch (2 minute) to an academic. In the group I was in I can’t say that we developed a clear pitch, but we did have an excellent discussion about how we would make these kinds pitches in our own organisations. We didn’t have to deliver our pitch, which was a shame as I think it might have helped the groups focus down to a practical output a little bit more. Then before lunch we looked at the challenging realm of understanding and managing resistance; including how resistance manifests and the steps we can take to address and hopefully overcome it. Quite a key point here was not emotionally engage but to view resistance as part of a broader context – 80% of our first thoughts on hearing an idea are negative, so this it is only natural for people to resist. After a fabulous bento box lunch (kudos Dominic) we went back into group work to generate as many objection to repositories and open access as possible, from the academic’s perspective. Or as I suspect ones that we ourselves have heard our academics talk about. This was followed by perhaps the most challenging part of the day when myself, Dominic and Bill moved to the front and essentially tried to offer our collective wisdom in how to overcome these objections. Interesting our approaches were divergent at times, but generally just as valid. Hopefully the rest of the room were able to take something away – although I’m aware we ran out of time to deal with all the objections on the day. After another tea break we broke into threes to roleplay academics and repository managers (and observers) with specific problems and objections. This was a chance for us to put all our learning into action, and naturally a chance for me to roll our my thespian skills once more. I hope my group enjoyed my embodiment of an academic! Finally we wrapped the day with feedback on this session and thoughts about the day. This was a really excellent day, and I’ve come away with some ideas and plans that I’ll put into action the next time I’m speaking to a group of or individual academics. It was interesting to note that a lot of the objections we face are very similar, which gives me hope that the routes to resolving them will become plainer overtime. Just before Easter I attended the Librarians’ Information Literacy Annual Conference, held this year in Limerick, Ireland. It was my first chance to step back and think about my new role as an Information Librarian at the university, so great timing for me. I attended a range of different talks on areas relevant to my own personal development (on librarians’ roles as teachers, and case studies of online tool use), but in this post I’m focusing on talks which I felt had institutional significance in terms of what we’re doing with information literacy, how we’re doing it, and what else we can do. The amount and kind of information literacy teaching inevitably varies within as well as between institutions: different courses and different disciplines have different needs. However, when responsibilities for information literacy are split between different departments and services across a university there are obvious benefits from tracking who does what: to make sure students acquire key skills, and to identify opportunities for collaboration. I believe librarians, as specialists in the area, have the responsibility to make sure these skills are developed, even if we are not always responsible for delivering them ourselves. Gillian Fielding’s presentation on The Information Literacy Audit at the University of Salford described an institutional audit as one way of doing this. The team at Salford took a checklist of key information skills to programme leaders across the university to determine what training was provided, how it was provided, at which level (pre-entry, induction, year 1, 2, or 3, or at Masters or PhD) and by which department / service. Despite difficulties with timing of the audit 70% of undergraduate course leaders participated, and it seemed like a really good way of opening up dialogues between central services and departments about what needs covering and how it can be offered. It certainly sounded like information I’d find useful, although they did have large number of subject specialists to carry out the audit compared to us! 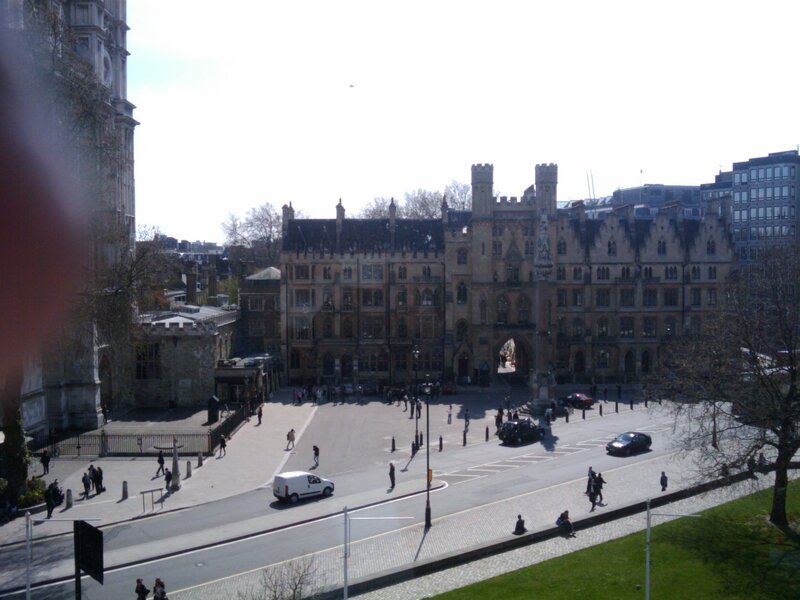 One of the big themes of the conference for me was about how the library collaborates with others in the university. In fact, the workshop I was at the conference to lead (focusing on central services’ roles in supporting research student communities of practice) was looking explicitly at the library’s role in the wider university community. Sophie Bury from York University in Canada covered a similar theme in her presentation on academics’ views of information literacy. The academics she surveyed pretty universally agreed that information literacy skills (as defined by the ACRL standards) were important. Furthermore, the majority thought librarians and academics should be working together to deliver sessions, a finding that she noted was echoed in some previous studies, with others suggesting that librarians should be handling this area. However, she also found a fairly even split between academics believing that sesssions should take place outside or within class time. This is an ongoing issue: sessions which take places outside of class time are not as well attended, but it’s easy to understand why academics are reluctant to jettison discipline-specific content for more general skills. How we fit information literacy into the student experience AND the student timetable is something I’ll be thinking about more over the summer as I look at my teaching for next year. Finally, as well as more ‘traditional’ information literacy, the conference also got me thinking about ways in which information literacy teaching can impact on a broader range of skills (see also Selina’s previous post about Critical Appraisal). Stephanie Rosenblatt from California State University gave a talk entitled They can find it, but they don’t know what to do with it looking at students’ use of academic literature and found that students were already competent enough at finding scholarly literature (the main focus of her teaching) but that they didn’t know how to use the academic materials. 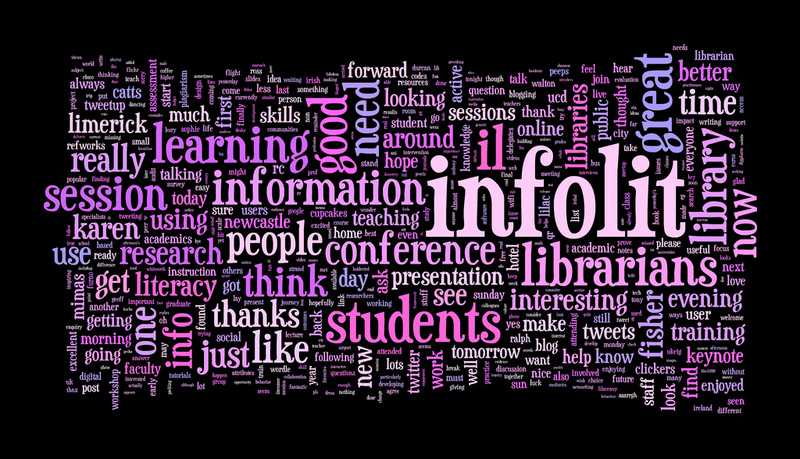 Should librarians be developing a more rounded approach to teaching information literacy? Aoife Geraghty and her colleagues from the Writing Centre at the University of Limerick discussed a way in which centralised student services could work together to support such activities. Lastly, Andy Jackson from the University of Dundee ran a workshop on generic graduate attributes, challenging us to develop attributes such as ‘cultural and social and ethics’ into teaching Endnote and Refworks use. This was immense fun (once we’d worked out that attribution and intellectual property could be seen as cultural and social ethical issues!) and made me think about all the different angles and educational opportunities that even the most basic software training workshops offer. The conference ended with a Keynote from Dr Ralph Catts talking about developing our research methods and evaluation (in time for the conference next year!). The appeal for librarians to involve educational researchers in their planning and evaluation was a little misplaced for me (I have a background in educational research, and was rankled by the implication that librarians universally lacked the ability to evaluate, rather than the resources to do so). However, I think his message about the importance of evidence in instigating, developing and evaluating our practices was sound. I definitely hope to use the research I learnt about at LILAC in the next few months, and I hope to do more reflection and evaluation as I settle in to the post. Kevin gave an overview of how CiteUlike sees its role in helping researchers and how it works. There is a huge amount of research information out there, so how do you find the good stuff? CiteULike helps you save reference data as you search via a CiteULike browser button, or inputting hte URL into your CiteULike account. You can gather the references from a lot of well known science resources, add it to a CiteULike group and/or tag it for you and other people to find. Tags help subject collections grow. Can have RSS feeds at tag, article, user or collection/library level. Helps with social discovery by automatically making your collection of reference open for anyone else to see/search. If you visit someone you find it interesting to browse their bookshelves – CiteULike allows people to do the same thing with your personal research bookshelf/library. Allows you to find socially filtered information and follow users/groups/tags you like. Can search the CiteULike database and also see what the post popular papers are via CiteGeist. Can also get data out by downloading machine readable data sets/libraries etc and/or export to other tools such as Mendeley/EndNote/RefWorks. Set-up recommendations (you might also like…) service to find tags/articles/people you might like. No interest in providing cite’n’write type functionality as main function is the social discovery aspect. I do wonder how biased this and other tools are towards the sciences? Are there other subjects using them, or do they tend to use other tools such as delicious? I’d been hearing a few things about Mendeley in the twitterverse, so I was interested to see it in action. It is being produced by ex-researchers or recent postgrads (no librarians… they said this is a blessing and a curse! ), and the main aim is to help researchers manage and discover knowledge. Venture capitalist funded (some of the people behind Skype and Last.fam) and they have taken a lot of their ideas and model from music sites like Last.fm. There is a Mendeley desktop app and a web account, which you can synch up. The desktop app is designed to retrieve bibliographic data from PDF articles you have saved, and create a searchable database of your PDFs. Can also read and annotate PDFs. helps you organise your research material and allows you to search within the fulltext a PDF and across all the PDFs you have saved. Citation plugin (write’ncite type app) for Word and OpenOffice. Can drag and drop references into Googledocs, emails and other apps. Can create shared collections (up to 10 people) and synchronise your PDF libraries across everyone’s desktop app. The desktop app synchronises with the web account and uploads/downloads your data and PDFs (but 500Mb limit on amount of data). Social aspect: Mendeley automatically makes all your references private, but gives you the option to share with your Mendeley contacts if you wish using collaboration tools. Data goes into web account and then downloads to desktop app when synchronised. Impact Data: can look into what is the most read document/author/tag on the desktop app. Also working on a recommendation engine based on user preferences and analysing keyword and fulltext of papers. Can creat public collections: subscribe by email or RSS and embed collection in other websites. More than 100k users and 11million fulltext research papers uploaded (217 million references) – at current rate of growth it could become the biggest research database within a year! What could this mean for impact factors? – potential for Mendeley to measure the interaction with the actual documents: the audience for it, how long people spend reading it, repeat readings, peer-review via comments/ratings, data available in real-time once paper published. Data on type of reader, impact within discipline or regions of world. Real-time Mendeley stats available via web app and will be releasing an API to make data freely available for people to study. Future plans: sustainable funding by charging for premium accounts (where you can have more file space), for fine grained stats, for shared accounts with more than 10 people and an enterprise version for companies. Future plans: collaboration tools for assigning tasks and for discussion, recommendation engine, search (but not download) fulltext), custom stats, integrate with library systems/openURL resolvers, free alternative to EndNote etc, free addition to Scopus/WoS. As the event had quite a few Librarians in the room, one of the first questions was about the legality of sharing PDFs and copyright implications, as when you create a shared collection for up to 10 people the whole group gets access to all the PDFs everyone else in the group has uploaded. It wasn’t particularly clear to me from victor’s answer exactly what they are doing about copyright implications other than taking PDFs down when publishers notify them that they are unhappy (they mentioned Springer). Their argument seems to be that there is a lot of research papers that are free to share, so there are legitimate uses for the software. Another is that researchers often email papers to each other and this offers a more efficient way to share them, and that staying within copyright law is the responsibility of the individual rather than the software. Not sure how the publishers will react to this over time…! I’ve not had a chance to play with CiteULike or Mendeley yet so I’d be interested to hear about your experiences with them. So, on Thursday January the 14th I made my way down a very foggy M1 to the Innovations in Reference Management Event, hosted by the JISC Telstar Project in Milton Keynes. I’m going to break the event down into a couple of posts, so this first one deals with the interesting things people are doing with RefWorks. The aim of this part of the project was to bring together references in a standard, structured format which could be inserted into course materials, and various parts of the VLE. It also allowed students to download, copy of annotate references so that they could become more active participants. Reference links with the moodle course site have persistent, dynamic links via OpenURL/SFX where possible, or no links if it’s a printed resource. The students can select the references and export into their moodle, MyStuff area, or RefWorks or collaborative area or download as RIS or RefWorks XML content. Constructing the reference lists: option in moodle to import the references from a standard data set, which then interacts with RefWorks to produce a OU Harvard style reference list. the same can be done via a RefShare RSS feed. The same system is used for inserting references into OU structured course content using a Word template. MyReferences moodle module: powered by RefWorks. A “RefWorks Light” that allows students to use RefWorks functionality without leaving the VLE. So they can create bibliographies within moodle as well. All the data in MyRefs automatically appears in their RefWorks account as well, in case they want to use the full RefWorks functionality at any time (e.g. the cite’n’write options). Staff have extra functionality which allows the creation of shared accounts and reference lists. To allow students to share references within te VLE they can export them from a reading list to the collaborative area. This creates script which they can then cut and paste into forums etc and it will then be rendered in the MyRefs format to allow others users to select/export etc. I thought this looked fab for OU students, so they can easily get all the references from their course into their own area and create bibliographies in the OU style, which could be cut and pasted into their assignments. Obviously not an option for Leicester as it is based aroud Moodle modules and no mention of Blackboard equivalent. Their catalogue doesn’t have an option to create lists of new resources bought/received so they were still creating manual/printed lists for their users. Paul looked for a way to do this electronically using existing or free resources. Solution: Subject librarians imported new book data into RefWorks ~ shared the RefWorks folder and created RSS feed ~ yahoopipes was then used to process the feed (takes the ISBN & scrapes Amazon for product description), it formats the html and inserts the book cover from Amazon, creates link back to library catalogue for the title & creates a “clean” RSS feed ~ Googlefeedburner then used to create a short URL & allow email subscription to feed & gives usage stats ~ used Feed2JS (freeware) to create a java script that could be embedded in Blackboard etc. also includes buttons fro links to services such as export to RefWorks, Catalogue, GoogleBooks & xISBN service (allows notification of new eds). This looked like a nifty and ingenious solution for a service short on time and resources. Paul was concerned about the stability of the service and whether he’s created an expectation that the same thing could be done for journal table of contents! With our current RefWorks subscription here at UoL we can’t create shared folders or RSS feeds because we don’t have the RefShare functionality, which is a separate subscription for us early adopters! All newer RefWorks subcription get it included (like Lincoln). In response to me asking about RefSahre at the event one of the RefWorks reps told me that all subscriptions should include RefShare in future, so *fingers crossed* we’ll get extra functionality to play with in future. The rep also confirmed that the license now includes alumni use – which means any student who creates a RefWorks account while studying with us can continue to use that account free of charge after they leave as long as the University still has a subcription. Yay! Just waiting for official email confirmation before advertising this to students. This session looked at how the repository interacts with all the other systems that an institution uses. Not just technologies but people as well, the repository can help identify and nurture your star performer academics. Recognising the role the repository plays as a knowledge management system. But also as a location for marketing, to tell stories, myths and legends of your institution’s research is a role the repository can play. Also the repository managers themselves are the star performers that institutions need to hold on to, by recognising them and ensuring their pay and benefits encourage them to stay. This talk aimed to take a more practical overview of the same issue, which started with Morag giving an overview of Glasgow’s repository. Like Leicester they aimed to join the repository and publications database together. It was important to develop policies and procedures to enable departments to engage with the repository on an on-going basis. Started by going out to talk to HoDs and research chair/champions in each department. Gathered information on their current practices on how they gathered current procedures. Self deposit for two depts, mediated for large faculties and proxy for most small to medium sized departments. Issue with materials in PMC going unharvested. Training sessions were run for administrators (from 30 depts) including the wider context of OA, something which I think is very important. Even if you are just adding material to a repository as part of your job, it is important you understand why it is important to academics and the institution as a whole; not to mention the global dimension. Glasgow are planning a large scale import of data going back to 2001, and adding staff number. In this talk John explained how his repo emerging from the embedding phase and into the mature phase. He looked at the problems they initially faced. Then he moved to look at the various sweeteners they could use to sell the repository and the publication cycle. Using a model like Leicester (alerts and request) to obtain materials got a low awareness in the academic community. They concluded that this was an unsustainable model for scaling up, something I agree with. RAE didn’t help, but elements of bibliometrics raised importance of the repository which they used as a basis for renewed advocacy push. Susan talked about maintaining momentum with a repository team over time. They have 7 people who have editorial rights over their eprints server, which is a considerable number for a smaller institution. However, repository work has to be competed for with all the other competing demands – these are not dedicated members of staff. As a team distributed over 4 campuses they have been using Sharepoint to draw the team’s activities drawing together. Finally Mary Robinson, talked about the UKCoRR repository skills set document which has ended up being used around the world. 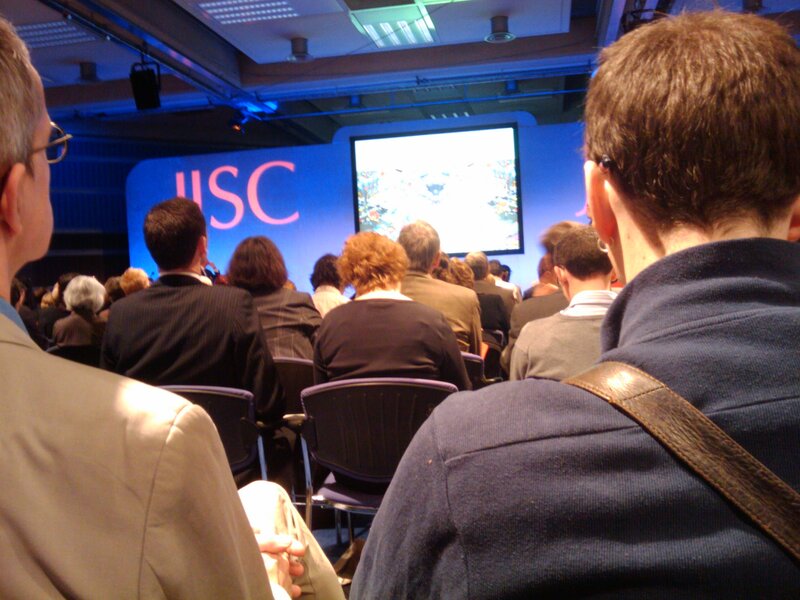 Dominic talked about the JISC recruitment tool kit for digital repository projects – which frankly was just the sort of basic things you get told at all kinds of recruitment training and didn’t appear to offer much of novel use – JISC reinventing the wheel again? Over all this was another very useful day and gathering of people in the rare position of being repository managers (there’s still less than 100 people in this country in this position – so it’s a very small but active community). I learned a fair bit and let’s hope I was able to share my own experiences with a fair few people. Let’s hope it’s not 18 months before the next event. And maybe we can have it North of the M25 (or on the south coast – I’m not fussy!). Twitter feed from the event. It seemed a long way to go, longer than going to Edinburgh for the Fringe the other week, but in the end thanks to my handy in-laws as an overnight venue, getting to Kingston UIniversity wasn’t such a difficult destination after all. Aside from some early morning shopping, the event today was all about sharing practical experiences of repository managers. Keynote: Bill Hubbard, UKCoRR Can! Bill (SHERPA/Centre for Scholarly Communication, Nottingham) talked about the founding of UKCoRR and the purpose of a membership organisation as a safe haven for repository managers to meet and discuss issues, away from other stakeholders in open access. He went on to talk about the vision and purpose behind UKCoRR – key among that being the professionalism and recognition within HEIs. He highlighted the RIN Mind the Skills Gap report as one that illustrated a clear role and need for repositories and their staff, not just libraries, as key partners of all those involved in the research process. The UK remains a significant global player in the world repositories, and potentially gives us the chance to lead the world. Need remains to get the disciplinary repository people involved in UKCoRR as well. NECOBELAC (Latin America, Caribbean and Europe Repo collaboration). Repositories should remember simple as a key feature – simple to access, simple metadata and simple content; although in particular the REF will seriously change the role of the repository. As managers we may need to be able to fight our corner and our significance against competing demands, which we might feel isolates us. How does the repository know when people are mandated to deposit by funders? There is a need to be involved in the research process from the start, not as an after the fact activity. And this is a position few if any HEI repositories are in. Here is where UKCoRR can help by supporting peer networks, by identifying needs, supporting collaboration, seeking funding, sharing best practice and acting as a voice for we repository mangers. There is a need for organisations like JISC to be lobbied by UKCoRR to support repository managers and processes from the top down. If senior administrators and academics hear about this from a body like JISC, then they might just take more note of our concerns and expertise. Following this talk Jenny Delasalle, Mary Robinson and Dominick Tate talked about their role as the inaugural UKCoRR Committee. This talk looked at the open access publishing side of open access, with Theo giving an overview of the current situation. The Gold OAP Route avoids a lot of the problems. There are a lot of new publishers jumping on board (e.g. PLOS) but also traditional publishers offering hybrid journals; with the option of the author paying a fee to retain rights or not. How can this be funded, how can this be managed and how can this change be communicated? Mechanisms for payment in this way are not totally new, with page charges for images in articles being around for years. Often these have been paid from unallocated fund, and this is not really a sustainable nor easily managed way. Wellcome Trust awarded additional funds to 30 HEIs, and other HEIs can apply to reclaim costs. At Edinburgh using this as an opportunity to step in for advocacy, and provide support to managing the funding. Noted that FEC can be included in calculation for researcher fees in grants. The feeds issue means that a lot of different departments and stakeholders within an institution are involved in the issue (finance, research, administrative staff, library, committees etc). No matter what they do, institutions need to coordinate these funds centrally and along the lines of acceptable standard policies. Edinburgh will be introducing a mandate in Jan 2010 and are spending the 6 months in the lead up to that talking with departments about how this will impact and how the repository can help them to meet the requirements of this. Noted that once you have introduced the idea of a central fund to pay for publication, top sliced from research grants, you have to maintain it – even if income decreases.